The exterior is minimalist, not garish at all, and very modern, which blends in well with the rest of the modern structures throughout the park. There is a sizeable exterior area with both shaded and sunny seating. When you enter, the first thing you notice is the crowds. I guess it's fitting that the world's largest McDonald's would draw the world's largest crowd (seating capacity is 1,500) and form the world's longest lines. It was almost 1PM, and the lines were out the door! Despite the crowds, the lines seemed to move pretty quickly. Servers moved down the lines taking orders in advance, so that by the time you reached the cash registers and paid, your order was ready and waiting. And despite the crowds, we had no problem finding seating on the second floor. The interior is gorgeous -- clean, simple and modern. I know, I know, you're thinking, that's only because it's a brand-new restaurant and because they want to impress all the Olympic visitors -- but actually, all the McDonald's I've been to in the UK during this trip have redecorated, and they all have this cool-cafe look. Seriously, does this look like a fast-food restaurant or a trendy eatery? We found a whole table to ourselves and sat down to enjoy a meal featuring local menu items like Chicken Legend (like McChicken, but served on a whole-wheat subway-style roll), Deli Wrap, McFlurry with Cadbury Wispa Gold, and Happy Meals with carrot or fruit bags and Fruitizz flavored sparkling water. * The 500 servers at the restaurant are McDonald's "best-of-the-best" employees, and have been flown over from around the world. * The current local Olympics promo -- free Coca Cola glass and coloured Olympics wristband with every large meal or premium salad -- is not available at this restaurant. because it's real glass and security restrictions are in effect throughout Olympic Park. Most interestingly, Molly told us the whole building will be dismantled after the Olympics are over, and every item will be either reused or recycled after the Olympics are over. Every piece of furniture, every fryer, every light fixture, every length of cable and wire has been tagged and will live a new life in another McDonald's restaurant -- about 75% total -- and nearly everything will be recycled. They have really planned ahead with the goal of reducing waste -- even the the "tiles" in the restrooms are actually wallpaper, because it would be impossible to dismantle real tiles without shattering them. It's good to know that the world's largest McDonald's won't be turning into the world's largest pile of rubble! Disclosure: Thanks to McDonald's for providing lunch at McDonald's, tickets for my family to enter the Olympic Park and tube passes to get there. The views and opinions expressed here are my own. We've been vacationing in the UK since July 4, and for almost a month now we've been traveling around Wiltshire county, London, France and Belgium. My husband has been doing all the driving, so I've been able to observe my fellow travelers on the motorway and see what kinds of cars people are driving. Cars in the UK and Europe are definitely smaller and more streamlined than their US counterparts -- no Hummers or huge gas-guzzlers here! Naturally, I've kept a special eye out for Toyota vehicles. I've seen a number of Corollas and Yarises (is that the correct plural for Yaris? ), as well as a Land Cruiser or two, but not a single Prius. Given that European car models are so much more fuel efficient already, I guess that's not such a big surprise. The big surprise was going onto the Toyota UK website and discovering that they make and sell a 7-seater Prius! The 7-seat Prius + is Europe's first full hybrid 7-seater has a fuel economy of up to 68.9 mpg combined (using T4-grade gas and the combined cycle) and costs £26,195 for the basic model. Oh. My. God. This is my dream car! When my friend Glennia and I test-drove the Prius V during our visit to Toyota headquarters last month, we both agreed that Toyota needs to have a 7-seater Prius V. And here it is, all ready to drive, right across the pond! Now that the kids are older, we don't need car seats any more, so all 3 can fit comfortably in the back row, which leaves plenty of trunk space for luggage -- but having the 3rd row would still be great for carpools, friends on playdates or visiting relatives. And the mileage, oh the mileage!! 68.9 mpg is better fuel economy than Alfie's motocycle! Of course, the engine displacement is just 1.8L, which is tiny for US consumers, but even if Toyota put in a bigger engine (2L? ), it would still be so much more fuel-efficient than our Toyota Sienna, which rarely gets more than 20 mpg. Don't get me wrong, I adore our Sienna, and frankly, it would rip my heart out to get rid of it -- but I think I could console myself pretty well with a 7-seater Prius+. Toyota USA, please bring the 7-seater Prius+ to America! Today is one of those days when I feel like the luckiest gal in the world. It's summertime! The sun is shining! My kids are gorgeous! We're on our way to Belgium! To eat Belgian waffles and fries! Can life get any better? Are you feeling as lucky as I am? Why not put that luck to good use by entering one of the great giveaways below? (and if you're hosting a giveaway of your own, don't forget to leave a link to it below!). Childhood is filled with magical moments, and no time is more so than babyhood, that fleeting period before baby's 24th month. It lasts way too short, yet is chock-ful of milestones, from sleeping through the night to that first magical smile to the first tooth, first steps, and so on. So many firsts! We experienced all those with our 3 kids, and many more. One of my favorite magical moments was realizing for certain that 3Po and Jammy were identical twins. The ultrasounds showed they shared a placenta, so it was highly likely they were identical, but you can never be sure. Our OB confirmed their zygosity after they were born by examining the placenta, but after seeing our newborns, we were far from convinced. 3Po and Jammy looked so different! There was almost a whole pound, and an inch, difference in their size and weight. Jammy had thick, dark hair, while 3Po had thinner, lighter hair. We had a DNA test done and the results came back 99.99% positive for monozygosity (identical). Still, we couldn't quite believe it.... until the twins were 3 months old and we took this Easter photo. Once we saw it, we knew we had wasted our money on a test that cost us over a hundred dollars to confirm what the photo showed clearly. To this day, I swear I cannot tell you which baby is 3Po and which one is Jammy. 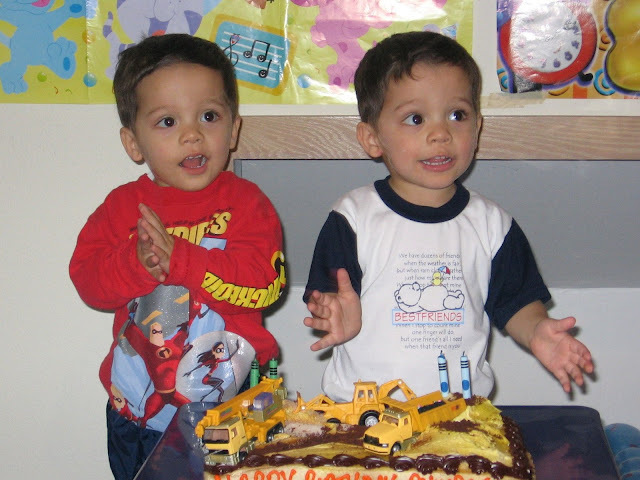 This is one of my favorite all-time baby photos of the twins. It was taken just a few days after the Easter photo, at my in-laws' Golden wedding anniversary party. 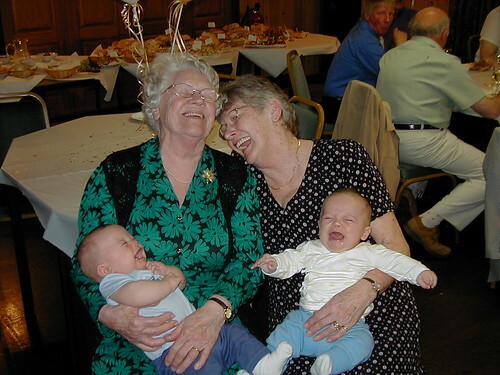 My mother-in-law (right) and her aunt (left) were laughing their heads off because they couldn't tell which crying baby was which, and the fact that the boys were both screaming their heads off in perfect tandem made the ladies laugh even harder. Thecank goodness there was a camera on hand to capture the moment! Magical moments is the theme and inspiration behind Disney Baby's "Little Character" baby photo contest. Entrants uploaded a photo of their baby's magical moments, showcasing their little ones' unique personalities for the chance to win $10,000 towards their baby's education and other prizes. Check the photos out and vote for your favorite; the cuteness is overwhelming! And if photos of cute babies aren't enough to get you voting, here's more incentive: during the Finalist Voting phase, voters will also be eligible for a chance to win a three-night stay in a signature Beach Bungalow at the Fairmont Miramar Hotel & Bungalows in Santa Monica, CA! You can vote once a day from June 28 till July 19, and each time you vote, you increase your chances of winning the Voter's Sweepstakes. Voting runs from June 28, 2012 — July 19, 2012. Remember, you can vote daily! Disclosure: A big thanks to Disney Baby for sponsoring this post and the Disney Baby “Little Character” Contest. Information is provided by Disney Baby via Splash Creative Media, and is indicated in italics. The views and opinions expressed here are my own. Today may be Friday the Thirteenth, but as the bingo halls say, Thirteen is Lucky For Some, so look at this as your opportunity to win big -- all those pessimistic folks won't be entering any giveaways today, leaving the winner's field clear for you! So check out the great giveaways below (and if you're hosting a giveaway of your own, leave a link to it here). Friday the Thirteenth, we're not scared of you! Only 10 more days and the London 2012 Olympics will begin! We love watching the Olympics, especially gymnastics. I grew up watching Nadia Comaneci, Mary-Lou Retton and Kerri Strug, and even though I never went into gymnastics, these girls have always inspired me to do my very best. Now there's another gymnast who can inspire millions of girls: McKenna Brooks, American Girl's 2012 Girl of the Year. Her movie, McKenna Shoots for the Stars, came out on Blu-Ray/DVD on July 4, and girls everywhere are enjoying her story! Have you seen it yet? We held a McKenna viewing party, and The Pea and her friends loved it! Want the chance to win your own copy of the movie? I have an open giveaway for a McKenna movie prize pack, ending July 30, and I'm starting another giveaway for the movie today! One lucky Bonggamom Finds reader will win a Blu-Ray/DVD (with digital copy) of McKenna Shoots for the Stars. Leave a comment on this post and tell me which character in the McKenna movie inspires your daughter (or which character is your favorite). This entry must be completed before any extra entries will count. 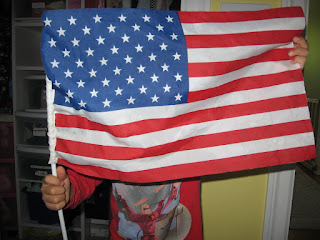 4) Repin any of the pins on my American Girl crafts Pinterest pinboard (1 entry for each repin, max 5 repins/entries). 8) Share the link (http://bit.ly/LLlQDG) to this giveaway on your Facebook page (1 entry). This giveaway ends at 11:59PM PST on August 5, 2012; I will draw a winner at random on August 6 and post his/her name after she/he confirms acceptance. Continental US residents only. For additional giveaway rules, click here. Good luck! Disclosure: Thanks to American Girl for providing the giveaway prize. The views and opinions expressed here are my own. There's nothing like a snuggle and a hug to brighten your day and make you feel loved. Cuddling with my kids and husband never fails to bring me peace and put a smile on my face! Our family is generous with the hugs, and as a result, our kids are not shy about showing affection. They even love snuggling with their stuffed animals and blankets! 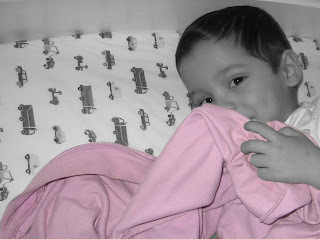 There are way too many children across America who are badly in need of something to brighten up their day -- and that is why fabric softener brand Snuggle has launched Snugs Across America, a movement to inspire people to spread love and softness, and in the process, spread some happiness to children in need. Just join Snuggle's mascot, Snuggle Bear, in sharing a snug (a cross between a snuggle and a hug) by uploading a snug photo on Snuggle's Facebook page. For each snug shared on Facebook, Snuggle will donate a stuffed Snuggle Bear (up to 10,000) to a child in need! Snugs Across America, encourages people to surround themselves with softness and share a snug, a combination of a snuggle and a hug. And, in exchange for snugs shared on Snuggle’s Facebook page, the brand is pledging to donate up to 10,000 stuffed Snuggle Bears to children in need by partnering with like-minded organizations, such as “teddies at the ready” children’s charity Hugs Across America. Leave a comment on this post and your favorite moment to share a snuggle with a loved one. This entry must be completed before any extra entries will count. 4) Repin any of my pins on Pinterest (1 entry for each repin, max 5 repins/5 entries). This giveaway ends at 11:59PM PST on July 31, 2012; I will draw a winner at random on August 1 and post his/her name after she/he confirms acceptance. Continental US residents only. For additional giveaway rules, click here. Disclosure: Snuggle is providing a Snugs Across America prize pack for the giveaway, as well as a second prize pack for me. Program information is provided by the featured company/product and is indicated in italics. The views and opinions expressed here are my own. Woo-hoo, summer! Summer is swimming in the sea and sandcastles on the beach and running through sprinklers on the front lawn and backyard barbecues and Fourth of July fireworks and roller coaster rides and road trips to new places.... and lots and lots of photos. Like me, I'm sure you'll be snapping away at every second in an attempt to capture those summer memories. Half the time I'll end up with blurred photos of kids with half-closed eyes, but sometimes everything comes together in one perfect shot that captures the perfect summer moment. That's the shot I'll post on Facebook to show everyone what a wonderful summer we had -- and that's the shot that Shutterfly wants to see on their Long Live Summer Photo Contest! Shutterfly launched it yesterday, and you can win a prize just for entering! You can win weekly prizes by submitting a photo that captures the weekly theme, and you could even win the grand prize of a trip to the Bahamas. For more information, see the Official Rules. Good luck! Disclosure: Contest information (in italics) was provided by Shutterfly. Shutterfly is sending me a complimentary custom photo book as a thank-you for posting about the contest. The views and opinions expressed here are my own. Remember the VaseOff! Challenge naming challenge I gave you a couple of months ago? The Society of American Florists (SAF) was looking for suggestions for themes for their Project Runway-style floral arrangement competition. Bonggamom Finds readers came up with some great ideas, including Twilight, Parisian, National Parks, Safari, The Eighties, the Olympics, even Hippies! Many readers suggested fairytale/storybook themes, 4th of July/patriotic themes and summertime themes. Well, guess what? They listened! Based on suggestions from Minted Life, Celebrate Woman Today and Bonggamom Finds, SAF came up with a great theme -- Summer Girl! The second VaseOff! Challenge is all about the sun, the surf, and the spirit of giving. Four contestants were given the challenge of designing an arrangement sure to delight a friend who loves the beach and can't get enough of the sun, surf and sand. The contestants got to work and rose to the occasion magnificently! Their creations are showcased in the second VaseOff! Challenge post, and they are amazing. You can vote for your favorite by "liking" the design that you think best evokes the Summer Girl spirit. My personal favorite (and the one I voted for!) is Tranquil Motion by florist Tony Medlock; I love the mix of blue and green colors, and the sand and starfish provide the perfect beachy touch. Whichever of the four entries you like, I think you'll agree that all four provide the perfect demonstration of how professional florists can create the perfect gift for any personality and any occasion. The Society of American Florists is giving one lucky Bonggamom Finds reader a $50 American Express gift card. Check out the finalists' entries in the second VaseOff! Challenge, then leave a comment on this post and tell me which entry you think best evokes the Summer Girl spirit. This entry must be completed before any extra entries will count. 6) Pin this giveaway on your Pinterest board (you can use the "Pin It" button at the bottom of this post -- 1 entry). 7) Like Bonggamom Finds on Facebook (1 entry). 10) Share the link to the second VaseOff! 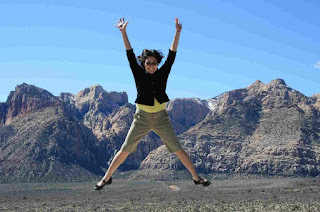 Challenge (http://bit.ly/Mbns3l) on your Facebook page (1 entry). Disclosure: I did not receive a sample or monetary compensation for this post. Thanks to SAF (via Ogilvy) for providing the giveaway prize. The views and opinions expressed here are my own. 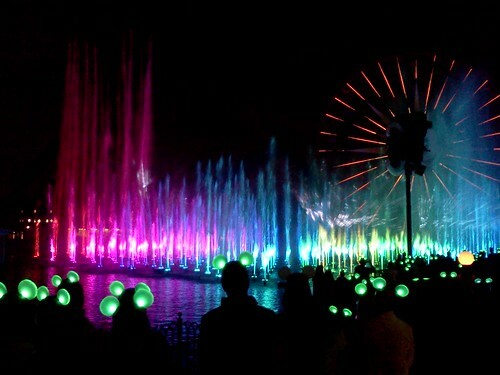 Like much of Disney's California Adventure, the World of Color light and water show has gotten an amazing makeover. Not only have parts of the show been changed to feature newer Disney movies (like Toy Story 3 and Brave), guests can now become part of the show by purchasing "Glow With The Show" Mickey Mouse ears that light up and change in time with the music! I was lucky enough to be one of the first to see the new light-up ears and how they interacted with the show, at a special media viewing of World of Color last month. Everyone who attended was given a pair of light-up ears. The ears have built-in circuits to receive signals to light up and change colors, in the same way that the big round lights on the steps of Paradise Pier light up and change colors with the show. The show is already amazing, but adding the light-up ears truly makes people go Oooh and Ahhh. It's truly amazing: sometimes the ears will glow one color, sometimes another, sometimes they will flash different colors at random so it looks like twinkling lights. 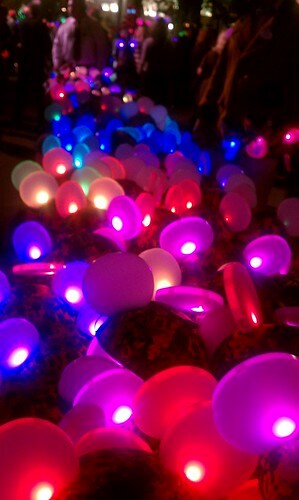 Sometimes different sections of the viewing area will glow with different colors. Disney officials say the ears will also work at the new Mad T Party dance party. At $25, they're a lot more expensive than glow sticks, but then again, you can't wear glow sticks on your head the next day, and every time you visit Disneyland in the future. And the experience of being part of the Disney magic was truly priceless! I have to say, the new Brave Storybook Deluxe app really hits the bulls-eye. Not only is it a beautiful interactive storybook, with great illustrations, background music and character voices, I think the bonus games and activities are some of the must fun I've seen in a storybook app. There are multiple reading modes, which you can select according your child's reading level or preference: Follow Along, Read and Explore, and Record Your Own Voice. Tap on the pictures and elements come to life in short animated sequences (i.e. the triplets pop up from behind chairs, will-o-the-wisps float around, Merida rips the tapestry, etc..). The one where Merida shoots a bullseye in the archery competition is a particularly long sequence, and it looks like it came straight from the movie. The app has 4 activities -- coloring pages, puzzles and 2 games -- which are way more interesting than any other storybook app I've ever seen. The coloring page images are not so detailed (i.e. no complicated scenery, just characters) so they're much easier to color in. They also give you a wider range of colors, including flesh tones, to flesh out (pun intended) your coloring. With careful swipes, I was actually able to color in a decent picture. The puzzles are more challenging, and therefore more fun for older kids. Jammy and I had a good time putting together this puzzle of the triplets. If only the app had a stopwatch we could activate to see who completed the puzzle faster, that would be even more fun! The Archer's Quest is lots of fun, because it's tied to the Merida's Challenge game. Archer's Quest is a scavenger hunt: as you go through the story, you'll see a quiver pop up in the lower right-hand corner from time to time. This means there's an arrow hidden in the page for you to find. Find the arrow and tap on it, and you've got an extra magic arrow to improve your score in Merida's Challenge. You can hunt for magic arrows 3 times (10 magic arrows each time), with the arrows being progressively more difficult (but never impossible) to find. Once you've gathered a quiver of 30 magic arrows, you can reset the scavenger hunt and start the fun all over again. Merida's Challenge is an archery game. Merida is riding through the forest with her quiver of arrows, shooting targets as she gallops past them. You start out with a quiverful of regular arrows (I haven't been able to figure out how many you start out with), plus any magic arrows you've collected in the Archer's Quest game. Tap the targets to aim Merida's arrows and hit as many targets as you can to improve your score. The magic arrows make it easier to hit bullseyes or splitting into 3 arrows or adding arrows to your quiver. The game ends when you run out of arrows. This is really a fun game! It reminds me of Temple Run: Brave, and my kids certainly play it almost as much. I do miss being able to add a virtual bookplate (with your child's name and photo) to the home page, but it's a small loss in comparison to the increase in functionality (and fun). At $6.99, Brave: Storybook Deluxe is more expensive than the Disney Classics Storybooks on iPad ($3.99), but with the richer functionality, it's worth the extra cost. 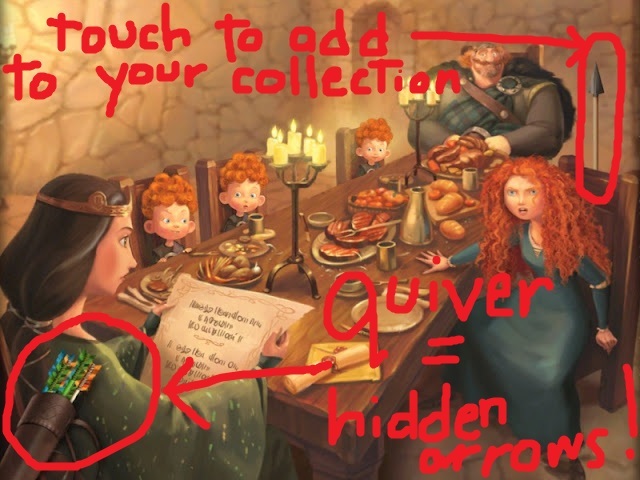 Frankly, I'd love it if the Disney Classics were $2.99 and Brave: Storybook Deluxe were $4.99, but just as Merida learned not to mess with fate, I'm not going to mess with Disney's pricing decisions. Disclosure: I received a free download of the app to review. The views and opinions expressed here are my own. It's amazing how time flies; three years ago, my boys were just learning how to read, and now they're making their way through Harry Potter and the Sorcerer's stone! Such is the power of a good book -- a great story and a great set of characters will inspire any child to read. Three years ago, a different set of characters inspired my boys to read: the quartet of literacy superheroes of PBS Kids' Super WHY! Watching Super WHY! episodes and completing a week's worth of Super WHY! Literacy Activities really helped them get started. I was lucky to have Super WHY! to help my boys, and parents of beginning readers these days are even luckier. Not only do they still have Super WHY! show, they also have the Super WHY iPad app to make learning to read even more fun. I received a copy of the app on my iPad to review, and even though my kids are too old for the app now, I wanted to give it a shout out because it's so similar to the lower-tech (but just as effective) Super WHY! printout activities that my boys enjoyed 3 years ago. And since it's an iPad app, not a sheet of paper, when kids play any of the 4 games on the app, it's almost like interacting with the Super WHY! show. Kids can help Alpha Pig find his way home by tapping on the letter needed to complete a word. When the word is completed, kids earn a virtual sticker for their collection. Kids work on spelling skills with Princess Presto, tracing letters on the touchscreen and making objects appear by touching on the letter sounds that Princess Presto makes. Wonder Red helps kids put words together by asking them to identify rhyming word groups. When kids correctly identify the word that rhymes with the other words in her Wonder Words Basket, they get a vitrual sticker for their collection. The final game in the quartet helps kids put it all together in a story, as Super Why asks them to select the word that completes the sentence so that the story makes sense. The Super WHY! app is a fun, educational way for kids to pass the time on a road trip, and plane ride, or (if you happen to be in the UK like we are) on a rainy, grey summer day when they can't get outside. The only possible downside in a world full of free apps is the price tag -- $3.99 -- but for the next few days, you can get Super WHY! app for $1 off at the app store. PBS KIDS’ SUPER WHY! app, is available at a special price in the App Store from July 2nd through 9th. 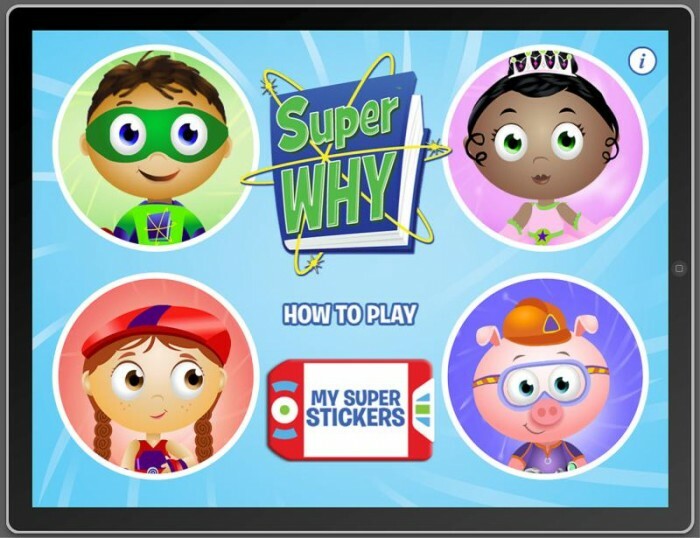 Starting July 2, parents can download SUPER WHY! for iPad for $2.99 ($1 off) and SUPER WHY! for iPhone/iPod touch for $1.99 ($1 off).